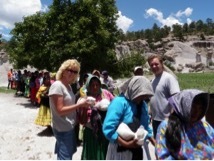 From the founding of Black Buffalo Global Missions, our calling has been to distribute food, clothing, medical supplies and blankets to the needy. We accomplish this in many various places and through many different means. Whether it’s in a tiny village on the banks of the Amazon River, in the mountains of Mexico, feeding children who are living in poverty in Guatemala, or feeding and educating orphans and needy children in Uganda, we endeavor to serve those that God directs us to with the same heart of compassion as Jesus. One of the ways we have done this in the past is through our Mission Adventure Teams. 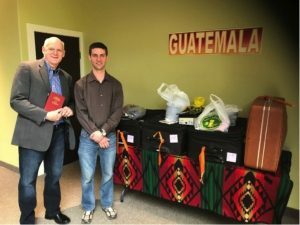 In preparing for their trip, each team member gathers items from their local church and community, and brings them on the trip. We then add large quantities of food and supplies and transport them to the neediest areas around our trip destination. 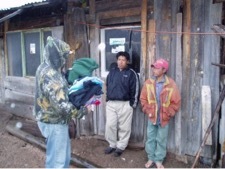 We share the gospel, then distribute the items to those who have gathered there. Many times these people walk from miles away because they hear through the grapevine that “friends” of Black Buffalo are coming to share with them. Years ago, Black Buffalo established and built a warehouse where he could gather and store donated items that would be given to the needy around the area where he lived in California. A notable story he tells is the time that a well-known soup company called him and asked if he could use some soup. Of course he said yes, and the next day two semi-truck and trailer loads arrived! Volunteers spent the next several days giving out cans of soup to the homeless, jobless and those just needing something to eat. God provides the food and supplies, sometimes miraculously, and we distribute it. Whether its bread, soup, fruit, medicine, blankets, clothing, or toys for children at Christmas, we distribute it to those in need as people give.